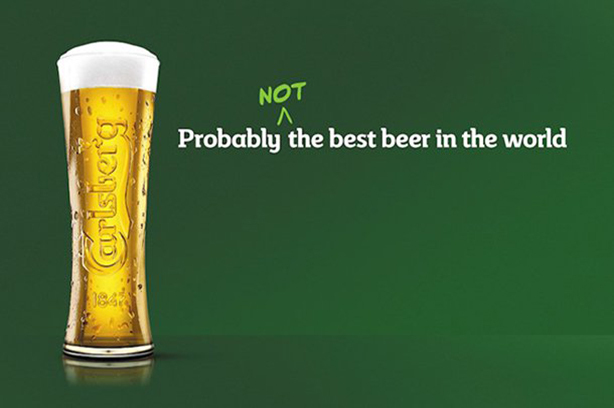 PR pros have largely backed Carlsberg's bold brand repositioning campaign for its authenticity and honesty. 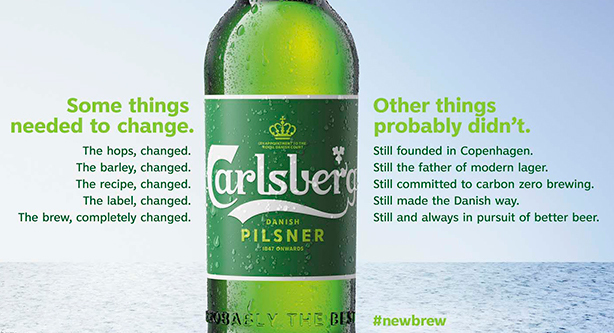 Yesterday, Carlsberg rolled out a bold campaign to acknowledge its standard lager was "probably not" the best beer in the world – a play on its iconic slogan – and that it had created a new recipe and fresh design scheme for its Carlsberg Danish Pilsner. The brand has used the famous 'probably' slogan for the past 46 years. The £20m campaign was created by Fold7, with PR support from Clifford French and Fleet Street Communications, and media buying from Initiative. It features executions in digital out of home and social media (15 April), press (19 April) and a new Mads Mikkelsen TV ad (23 May). In the messaging, the Danish brewer admits where it has gone wrong. "At Carlsberg UK, we lost our way. We focused on brewing quantity, not quality; we became one of the cheapest, not the best," said Carlsberg UK's VP of marketing Liam Newton. "In order to live up to our promise of being ‘probably the best beer in the world’, we had to start again. We’ve completely rebrewed Carlsberg from head to hop." Fold7 managing partner James Joice added: "Today, the value of brand honesty to consumers is more powerful than ever. But it is still rare to see brands hold their hands up when they don't live up to their promise. Carlsberg has not only been brave enough to do this, but have done something about it." Most PR agency bosses PRWeek approached found Carlsberg’s bold marketing approach refreshing. "Carlsberg doesn’t really do social media campaigns. But if they did, they’d be just like KFC," W Communications deputy managing director Sophie Raine said. "There’s a definite distinctive whiff of KFC in the #newbrew campaign," she added. "Nonetheless, I’m still commending copycat Carlsberg. As consumers continue to crave authenticity from brands, nothing screams it more than declaring your product used to taste like cat piss. "My guess is this is a £20m pivot that will pay off for Carlsberg." Munch founder and managing director Lizzie Earl told PRWeek that brands need to "walk the walk, rather than simply talking the talk". She added: "Making a U-turn on a marketing platform is brave, but will only generate positive goodwill among consumers who will respect the honesty and the candidness – especially if it matches up with their reality and experience of the brand. "There’s simply no point having a marketing message that is no longer true. I’m sure Carlsberg’s PR teams will be excited about their work to follow." Eulogy founder and chair Adrian Brady is another fan, claiming consumers have become frustrated by politicians and some brands not giving straight answers. "People can only congratulate Carlsberg for playing with a very straight bat on this," he added. "It’s brilliant and reminds people that transparency cuts through everything. Any cynicism and questions about the past is largely pushed to one side when you actually front something." Brady also paid tribute to Carlsberg’s move to "fix their core consumer offer" rather than "trying to polish a turd". Frank managing partner Alex Grier said the campaign allows Carlsberg to play on their famous end line with "a fresh twist". He added: "A brand with heritage finding new (and fun) ways to talk about that heritage. And there’s perhaps even a little bit of 'marmite' style brand honesty in there (love or hate). Lastly it allows them to talk about the brewing process for what is a mass produced lager, but in a way that is more akin to that of a craft beer." But not all PR pros believe admitting their product was not up to scratch is the best way to relaunch Carlsberg’s pilsner to the UK market. PrettyGreen founder and CEO Mark Stringer told PRWeek that although he has never really been a fan of Carlsberg’s beer, this new campaign will merely "cement the relationship of Carlsberg being a poor-tasting lager in consumers' minds". "Quite frankly, most of us probably can’t be bothered trying to see whether it has or hasn’t improved. From a PR perspective, [it's] much easier to say ‘new improved taste’," he added. "Picture the poor PR having to ring up journalists now and say, 'hi, our beer used to taste really shite but now it tastes as good as every other lager, want to write about it?' or even better, want to write about the new ad? "Not all PR is good PR, just ask Julian Assange about his toilet habits." Carlsberg still has a job to do to convince consumers its beer can probably become 'the best' again, but this refreshingly honest approach has at least the support of many comms professionals.